IT’S not a bad idea to introduce your children to the wonders of cooking at a young age. Cooking can prove to be a useful life skill for them as they grow older. It’s also a way to teach them about nutrition and responsibility. 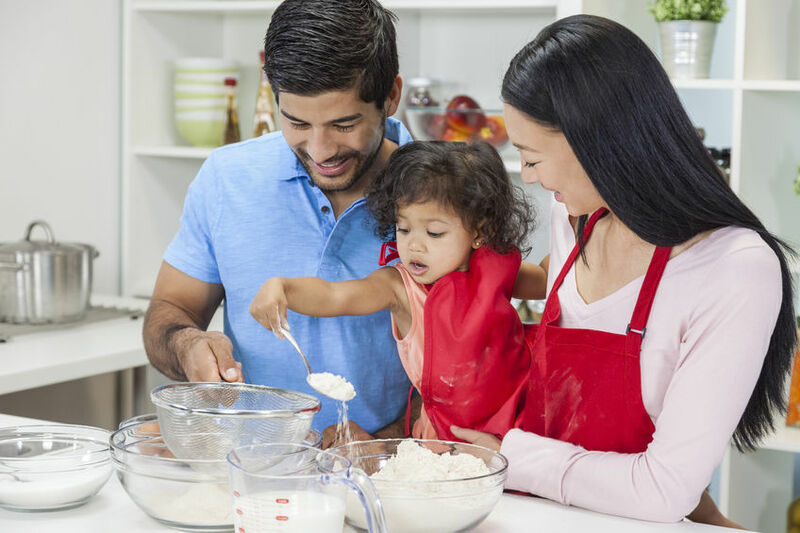 Before you start teaching your children about cooking, please remember that your kitchen needs to be child-friendly. 1. Set up a kid pantry. Your child may not be able to access ingredients placed on higher shelves. This may lead to an attempt to get to the ingredients that may result in an injury. To avoid this, reserve a part of the kitchen for your child. Stock up a shelf that’s close to the ground; this makes it easier for your child to grab what they need. It’s also a good idea to reserve a lower shelf in the fridge for your child for the reasons mentioned above. This will help lessen the possibility of your child knocking anything over while trying to reach for an ingredient on the higher shelves. 2. Buy some kid-friendly kitchen tools. It’s best not to allow your child to use the kitchen tools that you already have. Some kitchen tools may be too big or too sharp for kids to handle. Buy a separate set of tools made for kids. Silicone tools are a great option to look at as not only are they easy to clean, they come in colours that make them more appealing to children. 3. Get a step stool. Getting a step stool allows your child to feel included in the kitchen. They can use it to watch you prepare a meal, or to grab ingredients that are difficult to reach. Although chairs in the kitchen may seem like a good alternative, do note that step stools for children are designed with their needs in mind. 4. Keep it safe with rounded kitchen counter tops or soft corner guards. Kitchen counters with sharp edges can prove to be dangerous to children. It’s best to get kitchen counters with rounded edges. If you already have counters with sharp edges, buy some soft corner guards. This reduces the chances of your children injuring themselves if they were to run into the counters. 5. Worry not with some induction cookers. Induction cookers reduce the risk associated with exposing your child to an open flame. Some induction cookers are even safer as they come with a child lock. They’re safer because they directly heat up the pot on it while keeping the cooktop surface cool.